While religion and spirituality is losing more and more of its relevance in Europe, America has lately proven to be a fertile ground for evangelical Christian literature and art. 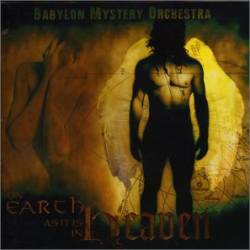 The end times are near, supposedly, the Revelation of John more popular than ever, so an album like On Earth As It Is In Heaven by the one-man-project Babylon Mystery Orchestra shouldn't come as a surprise, especially since Sydney Allen Johnson comes from the Southern state of Alabama. But don't be frightened away now, as he is smart enough to know that simple proselytising is just too lame. Instead he researched texts from the Old Testament and the Dead Sea Scrolls to come up with a story of pre-Noah times that even left me open-mouthed: Angels invented a kind of percussive hypnotic music (rock'n'roll), that combined with colourful body paintings (tattoos) was used to goad people away from God into the claws of Satan. BMO tell this story, as a concept album, and although there are a lot of Bible quotations, the audience is free to make up their own mind. Because can all rock'n'roll music be satanic when Mr Johnson is using the same to convene his message? As interesting as the story is, the music itself doesn't make up to it. The music is a combination of heavy gothic metal with dark wave elements. Johnson's voice is rather untypical, he doesn't sound neither like a classic metal vocalist nor like a more aggressive member of the metal kin. Instead he has a rather low voice with a weird kind of tremolo, reminding me of German punk godfathers EA80, but at times also slightly of Sisters Of Mercy. Another band I am reminded of are the Christian doom metal band Saviour Machine who also used Old Testament stories to create interesting concept albums, with a similar take on the darker side of metal music. Two songs really work well. A Celestial Kiss has true hit potential, showing BMO from their most commercial side, while the ballad Rainbow's End has very moving keyboard sounds... and no drums. There lies the main problem: the drum computer has been programmed in a rather sterile way, thus stripping the music of much of its energy. If this CD had been done by a regular band instead by one guy doing everything, it would have been one of the most interesting dark metal offering of recent times, but the way it is, you get good solid songwriting marred by a not too great production, although the interesting and original concept makes up for that. Friend of rocking dark wave music and those interested in early Bible stories should still check this album out.